Today I want to finally review the Timeless 20% Vitamin C, E & Ferulic Acid Serum. This review is long over due but when it comes to testing out potent anti-aging products, my sensitive skin requires extra time for testing purposes. This is especially true for vitamin C (VC) products as my skin hasn't played well with other serums in the past. While L-Ascorbic Acid (L-AA) might be the best form of vitamin C in terms of collagen production, UV protection, fading scarring and hyper-pigmentation, it has been known to cause skin irritation and sensitivity. So as you can imagine with my sensitive skin, I started the process of adding Timeless VC into my routines very, very slowly. I usually touch base on patch testing further into my product reviews but due to the nature of VC, I feel I need to write about how I incorporated this into my routine. Every product I use goes through a very detailed patch testing period. I always patch test and I recommend patch testing to everyone. This is how I introduce new skin care products to my easily irritated skin. Patch testing can look different for everyone but for me, I test products in stages. For this VC serum, I applied it to the inside of my wrist, neck, chest and behind my ears. I applied this serum to those areas for a few weeks, yes weeks. I did see some irritation/sensitivity, redness, flushing but nothing too serious so I began adding a tiny drop to different parts of my face for many weeks. I saw the same flushing and slight irritation/sensitivity but again, nothing serious enough to stop the testing process. I began adding more and more product until eventually I was applying the serum to my entire face. I will say that during these many weeks of testing, I was traveling, I got sick, menstruation etc happened and I broke out, so I wasn't sure if the VC serum was exacerbating the situation so I would back off using this on areas where I wasn't having breakouts. I came to find that this wasn't causing breakouts but it was making my skin more sensitive. Was my skin more likely to break out from this increased skin sensitivity? I honestly don't think so. Regardless, I needed to take this crazy amount of time to really test this product because I have sensitive skin. Another challenge was the weather, which so wacky and I know this made testing out this serum more complicated. Lastly, I also had an IPL treatment and a microdermabrasion during the testing period, so you can see why it has taken me a long time to test this product. Ok, now that I have bored you all with the craziness of my patch testing, let me talk about my skin. To start, my skin type during this testing period was normal to dry and now it is more combination. My skin can also be quite temperamental during seasonal changes and is very acne prone. I would also like to point out that with the incorporation of tretinoin into my weekly skin car routine, I have noticed less breakouts but my skin is more likely to be sensitive. My review will reflect how this serum works for my personal skin type and condition and as always, your results may vary. Although my skin can be very sensitive, this product did not cause any negative/allergic reaction. 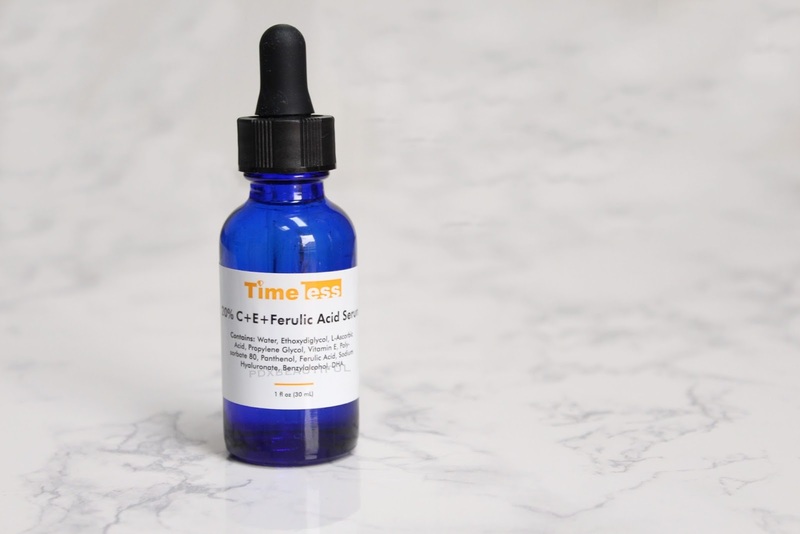 Timeless does not make huge claims regarding this VC serum. They do say that it can help reduce fine lines and wrinkles as well as nourish and replenish the skin with the use of this high quality VC serum. From website: Contains Vitamin C, an antioxidant that evens skin tone and helps build collagen. Also contains vitamin E and Ferulic Acid, used to extend the life and effectiveness of vitamin C. We use a 20% concentration of L-ascorbic acid for maximum benefit. Our product is guaranteed fresh and effective for 3 months. I appreciate that the brand does not over promise. Regardless of what Timeless claims, research has shown that the use of a well formulated vitamin C can increase collagen production in the skin, even out skin tone, fade scarring and hyper-pigmentation and provide UV protection. You can learn more about Vitamin C here. You can also learn so much about vitamin C, it's various forms and which would be best for your skin, listen to one of my favorite podcasts The Beauty Brains. PH Level: For this product to be effective, the pH level must be at the correct level. As seen above, the Timeless Vitamin C serum is about a pH level of 2.4. Again, The Beauty Brains can help understand the importance of pH levels when it comes to using vitamin c.
This serum comes in a 1 fl. oz/30 ml housed in a dark cobalt blue glass bottle with dropper. As you can see from the above picture, this serum is a slightly watery, clear gel that has an alcohol scent. There is no added fragrance, or fragrances added to cover the alcohol scent. L-ascorbic acid naturally has an alcohol type of scent but dissipates upon application so I appreciate Timeless did not add any masking fragrance. This absorbs fairly quickly into the skin when you apply the correct amount. As women, we can get very heavy handed! I bring up this point because you only need no more than 4 drops of the serum to cover your entire face. Applying more can require longer absorption time and can fell heavy so less it best. I would like to mention that out of the many VC products I have tried over the years, this one has the best texture, which is lightweight and non-sticky. While the Timeless VC serum is very similar to the popular Skinceuticals, there are some significant difference. First, Skinceuticals has a patent on the pH level which covers ascorbic acid between a pH of 2.5 and 3.0. Other differences is that Timeless has few preservatives and an added emulsifier. Skinceuticals has stabilizers and a pH balancer, namely Triethanolamine. Both formulas oxidize over time and change color however, Skinceuticals claims that although oxidation does occur, the stability testing indicates that their formula is 88% as potent even after a full year. The Timeless VC serum is a pH level of 2.4, just below the patent level! Also, Timeless does not claim that their product will last a full year of storage and in fact, they only guaranteed fresh and effective for 3 months (longer if stored in the refrigerator. So while these two serums do show a difference in length of efficacy, these two are too similar in my opinion to warrant paying the high Skinceuticals price at $165 for 1 fl. oz/30 ml. Even if you had to replace your Timeless serum 4 x per year, the cost is Skinceuticals version will cost approx. $100 more per year. The picture above shows the left side of my face in January and the picture on the right is my skin today. Granted I have had 2 IPL treatments (which doesn't correct red scarring), one microdermabrasion (which helps to somewhat treat red scarring) plus I do use a ton of well formulated skin care products both day and night as seen in my Instagram posts here! Overall, my skin shows less brown pigmentation, it's brighter, more radiant and plump. I have used this VC serum on both my face and neck (I urge you to do the same with all of your skin care products) and you can clearly see the natural creases and lines that have formed on my neck are softer and less pronounced. And before you ask, I did not have the IPL nor the microdermabrasion treatments done on my neck, just my face. I am very happy with the results and overall, I feel this product make my skin look more even toned, bright, plump and less dull. Although I still have scarring that I am working to correct, my skin just looks more radiant and translucent. I will warn those sensitive & reactive skin folks out there that if they are thinking about adding a VC product into their routine, please take it very slow! Vitamin C is an aggressive, exfoliating ingredient and when not used properly can cause more damage than good. Some of the other disadvantages is that vitamin c is very hard to keep stable. Light and air can weaken and compromise the ingredient and render it useless. Furthermore, in order to be the most effective, Vitamin C must be formulated at a certain pH, which is rather low and potentially irritating and will make the skin more sun sensitive. However, VC does so many amazing things for the skin that if your skin can tolerate it, I would highly suggest adding this ingredient into your skin care routine. When added to your daily skincare routine, a well-formulated vitamin C serum or treatment can provide amazing benefits ranging from helping to even out your skin tone and texture to shielding skin from the visible impact of pollution from the environment. Vitamin C has also been proven to significantly improve hydration, so among all the other positive attributes, this powerhouse ingredient will help keep your skin looking younger. Thank you for sharing! I love Vitamin C serums and this has been on my wishlist. Looks like I'll go ahead and purchase now! This was such a great post!!! I've been comparing the two items (I'm still so torn) bit this checked 5 more boxes for the Timeless brand.